The case of Bordeaux blanc from the Bordeaux Council sat in the corner of my tiny London flat like an elaborate piece of 17th century furniture. The idea of drinking Bordeaux blanc everyday is very grand, but how does this classic style of wine fit in with my not-so-classic, real life? Instead of opening all the bottles at once, we opened up a bottle or two every night with dinner to see how it worked with food. Which it does. Spectacularly. But not with everything. Don’t believe the label if it ever says aperitif – you will be wasting half the experience. Most Bordeaux blanc is better with food. There are better aperitif wines out there but there are not as many complex food wines out there as Bordeaux blanc. I photographed my week of meals at home (and one special occasion meal on the weekend) pairing white Bordeaux with food. Here are the results. 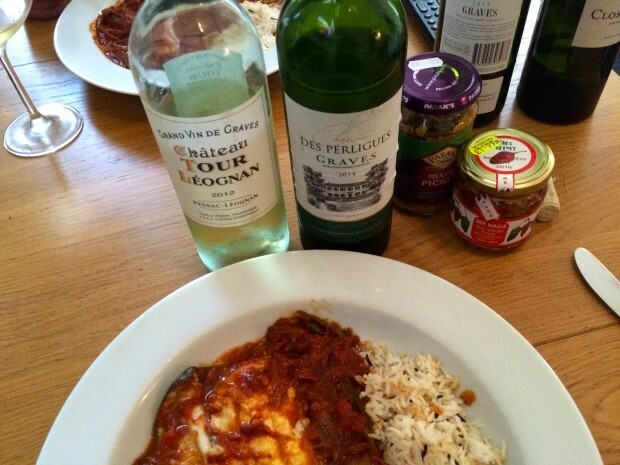 But first, some tips on buying white Bordeaux under £20. The last bottle of Bordeaux blanc I had was a bottle of 2011 Smith Haut-Lafitte – not an everyday wine at £60-£70 per bottle (it was from my time working in fine wine). There is a lot more to Bordeaux than the cru classé wines. But while there are some good wines under £20 per bottle, there are also quite a few variations of style at this price, too. What comes under the umbrella of Bordeaux blanc is Entre-Deux-Mers, Pessac-Leognan, or Graves. Some labels are old school and don’t give much of an indication of the taste of Bordeaux blanc. Not everyone will understand that a wine with Muscadelle will be aromatic and fruity, for example. What you need to know is that Bordeaux Blanc sits on a spectrum between bright and fruity (gooseberries, pineapple, tropical fruit, etc) to creamy and rich (cold white french butter, waxy candles) and everything in between. The blend of white grapes found in Bordeaux makes it a versatile choice with food. Some bottles evolve over the night between the two extremes of fruity and fresh and creamy and rich. My advice is to go for bottles around £25. Under £20 per bottle, unless you get good advice, it is difficult to tell what the style will be like from the label alone. Behind the generic Chateau on the label, there can be a wine that is anything but generic. There were a few surprise food and wine matches over the week. Let’s start with Friday night. It’s the end of the week. Not feeling very glamorous. Thank god, it’s Friday night take out. This fruity style of Bordeaux blanc goes well with fresh green herbs such as parsley in tabbouleh (Lebanese parsley salad), broad beans and it loved the garlic sauce (toum). Fresh and clean aromas of cut grass, elderflower, asparagus. The palate is plumped with melon and has the warmth of Bordeaux – there is more weight on the palate than expected from the first fresh characters found on the nose. You don’t get more aromatic than Sauvignon Blanc but the even more intense aromas of Muscadelle is a good balance. Verdict: Roast chicken is a classic match with Bordeaux blanc, but the fresh green herbs in the tabbouleh is the revelation here. As parsley is in so many sauces and salads, this makes it a surprisingly versatile wine. Just because it is fruity and fun at first, don’t write it off too quickly. Seriously good fun. On the first taste, it is a simple, fresh Sauvignon Blanc. Enter the food: with the fish and butter sauce, the wine becomes big, buttery and opulent. The palate is classic full and rich, almost a Chardonnay in weight. The aromas are exotic: tinned lychee, rose petal, melon, even mango. The samphire is particularly good – perhaps because they are both from an estuary, we joked (but maybe!). Talented winemaking consultant and professor, Denis Durboudieu, advises the Ballande family small vineyard of 4 hectares of white in Pessac-Leognan. A lot of wine here for £20 – it is a shapeshifter. Verdict: White fish and butter is another classic pairing with Bordeaux blanc. 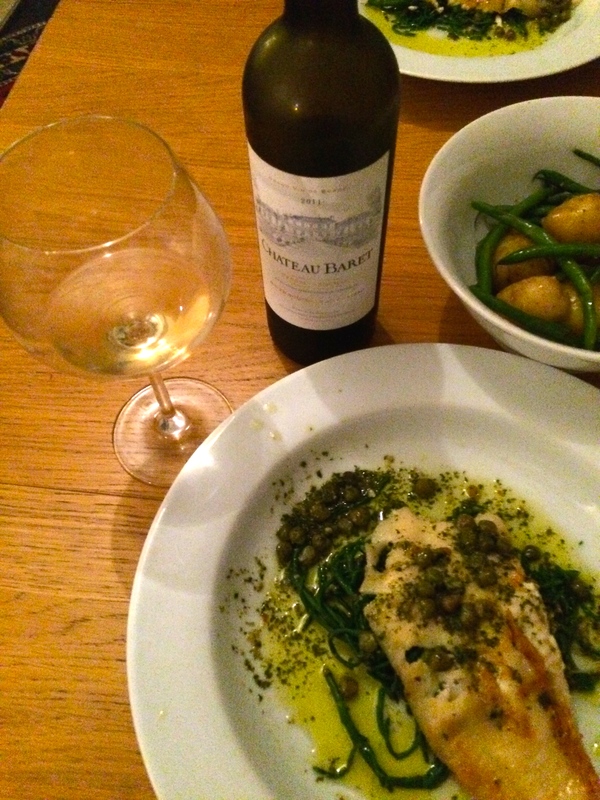 The green samphire (in season) brings out the full character of the wine. This is my favourite wine. Hand in glove, as Morrissey would sing, with the veal chop and creamy sauce. It tastes as refined as cold white French butter. Incredible smoothness and elegant fruit. Again, the BB picked up the herbs in the sauce. Very fair price. Chateau du Druc is situated on classic gravel soils overlooking the vineyards of Sauternes and facing the Garonne; one of the best positions in the region. This shows why 2012 is hailed as a great vintage for white Bordeaux. Verdict: A real find – but I would never have chosen it at a shop on the label alone. It was also good with the fish curry later on in the week. Grassy nose, fresh herbs, so fresh! Mouthwatering, long fruity finish. White peach orchard fruit, grapefruit notes. Very fruity, zingy – maybe better with a fish dish rather than veal. A little bit young and vigorous. It would benefit from a bit more time but huge kinetic energy. Wine nerds may know Clos Floridene is Denis and Florence Dubourdieu’s wine. They also own the more famous Sauternes Château Doisy-Daene (and he is a wine consultant for other wines, such as Chateau Baret, above, and Chateau Tour Leognan, below). Verdict: On the fruitier side of the spectrum at the moment, it is one to watch over the next few years, especially in the excellent 2012 vintage. with tomato fish curry (tomato, garlic, ginger, kashmiri chilli, a couple of fresh green chilli, onion, tomato, tamarind water, ground coriander and turmeric) and wild rice with clove, cardomon and cumin. To be fair, this would be a challenge for many wines. Sometimes it is not as simple as “white meat with white wine”. Again, it is all about the sauce. The poor thing had trouble dealing with the complex spices in the curry*. The sourness of the tamarind made the wine more like a basic Sauvignon Blanc, giving the wine a simple lime flavour. This is a wine from the supermarket Waitrose that is trying to please everyone but not really pleasing anyone, especially in context of the other Bordeaux blanc wines. It is good but not as good value as some of the other wines tasted that may take a little more effort to find. It was even more disappointing as Chateau Tour Leognan vines are from Chateau Carbonnieux where the wine consultant is the superb Denis Durboudieu. Verdict: Don’t have Bordeaux blanc with curry! Otherwise, a good introduction to the style, especially if there is a price reduction at Waitrose. Very bitter with the curry. * Stopped drinking it with the curry and left it for another time. Without food it was grassy and fresh, with a hollow middle, and a slightly bitter note on the finish (but not unpleasant). A bit young and nippy – it is the youngest of all the wines tasted. Verdict: Too young. Try it again next year (and definitely not with a curry). 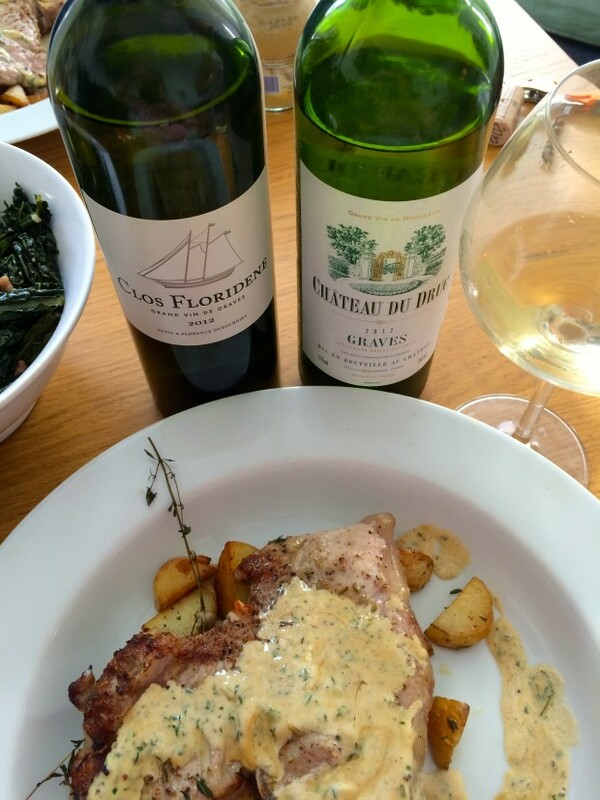 * we also tasted the leftover Chateau du Druc and the Clos Floridene with the curry, and they both stood up well to the complex spices. This is the most classic of French wines but it is also surprisingly easy to match with food if you remember the parsley, butter and garlic trinity (and French wine loves a bit of sauce). I am a fan of white Bordeaux and love its versatility. Have tasted some fantastic 2014 white bordeaux recently on a trip there. Thanks for writing about white Bordeaux. I think its often overlooked. 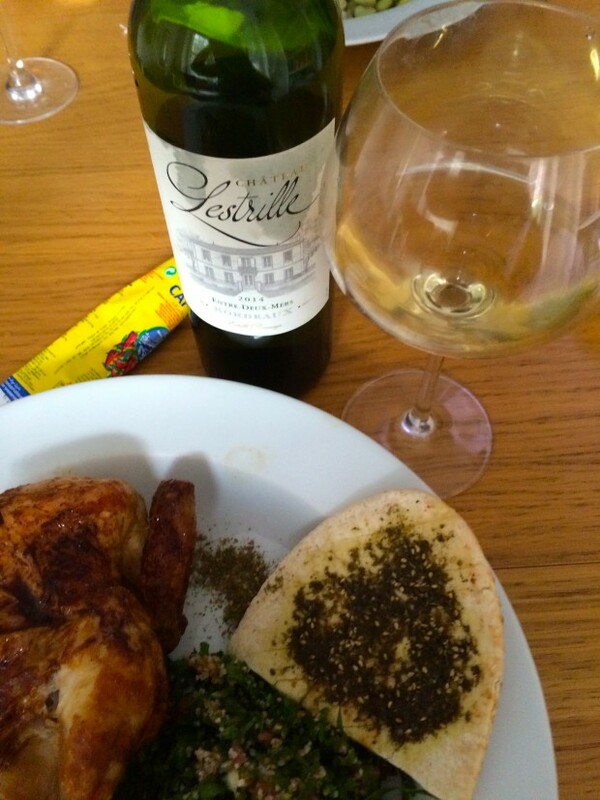 Great post Juel – and the food looks absolutely delish.